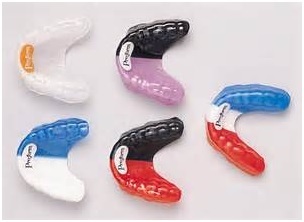 Athletic mouth guards are made of soft plastic and are adapted to fit snugly over upper teeth. When you consider that the average cost of replacing one lost tooth is approximately $5,000, mouth guards are a wise investment. In addition to protecting teeth, they protect lips, cheeks and tongue. 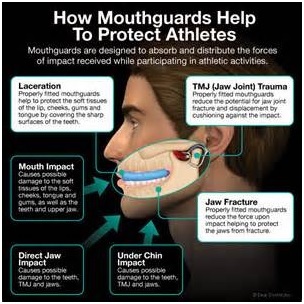 Mouth guards should be worn whenever you are involved in an activity that can result in falls or head contact with other players or equipment. Some of these sports are football, baseball, hockey, basketball or soccer. Football and hockey are the most dangerous for teeth but nearly half of mouth injuries occur in basketball and baseball. What type of mouth guard is best? Any mouth guard is good, as long as it fits comfortably. If it interferes with breathing or speech or feels bulky, it will not be worn. To ensure proper fit, protection and comfort, consult a Denturist. All mouth guards should be stored in a plastic container, to avoid damage due to heat or cold. They should be washed with cold or lukewarm water after each use; hot water may result in distortion. You may choose to rinse your mouth guard in mouthwash prior to use. Mouth guards should be replaced every two to three years. No matter what your age or sport, mouth guards are critical to sports safety. Protect your smile and preserve your health; ensure that you have a professionally made and properly-fitted mouth guard.